Apple Music is currently the most satisfying music streaming service with customers. 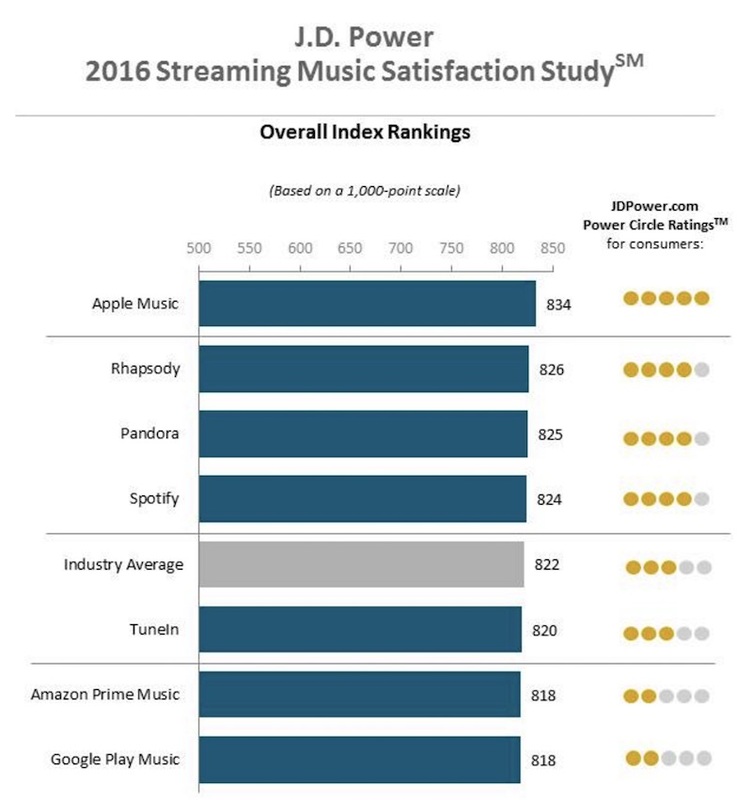 Apple Music tops Spotify, Tidal, Pandora and others in a recent study performed by JD Power. Apple Music is currently the most satisfying music streaming service with customers. According to up-to-date findings from JD Power and Associates, the iPhone manufacturer’s service is proving to be a hit with its massive customer base. JD Power’s average customer satisfaction rating for the study was 822, according to a chart on their website. The chart also takes into account customer service and what content the service provides for its users. Apple Music has a rating of 834 and is actually the only service over 830. Image courtesy of CNET. Findings provided by JD Power. Apple Music has overwhelmingly positive reviews, with their customer service and level of content being the most positive. Apple Music also has an advantage, as it is installed on every iPhone. With iPhone’s being immensely popular, it’s no surprise it’s popular amongst customers. In an interesting trend, Spotify, Pandora and others are ranked much lower than they would expect to be. Rhapsody follows Apple Music with a rating of 826. Pandora and Spotify are in 3rd and 4th place with ratings of 825 and 824 respectively. Amazon Prime Music and Google Play Music scored 818, showing below average reviews. Amazon Prime Music is relatively new to the market, but Google Play Music is not. A trend amongst users involves their ability to use social media when using a particular service. CNET took note of how users tend to enjoy sharing their playlists and music selections with their friends on a variety of platforms. For example, Apple Music does allow users to share their playlists on Facebook, and if a user allows it, they can have others add songs to it. Three of the top services in the findings, Apple Music, Rhapsody and Spotify have this feature, regardless if a user is paying for the service or not. Users are also more likely to pay for services in order to have more features, such as being able to skip songs or have exclusive content. This is a feature the more popular music streaming services can provide for its user base. For example, Spotify has interviews from bands and artists for its premium users. An easy-to-use interface also plays a huge part in customer satisfaction. Google Play Music scores incredibly low in this category. In today’s constantly connected world, there are more than a few music streaming services to give listeners the music they crave so bad. Whether it is Apple Music or Spotify, it all comes down to what the user would like.